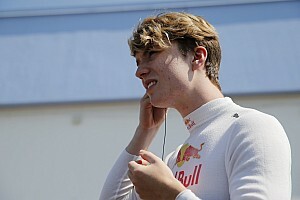 Alex Lynn won the 2013 running of the Formula 3 Macau Grand Prix, leading home António Félix da Costa in a tense encounter. 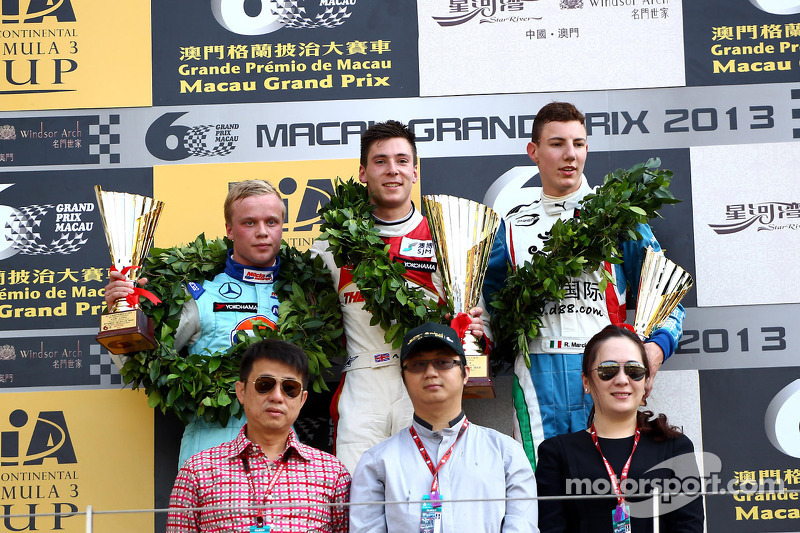 In Macau this afternoon a Prema Powerteam car ended up the winner, but not in the hands of Raffaele Marciello, who was being tipped to win by many pundits before the start. Instead Alex Lynn drove a faultless race, holding the lead from the first corner, and not relinquishing his grip on it despite a Safety Car period that might have proved problematic; his efforts saw the return to the top step of the podium of Theodore Racing (in conjunction with Prema) after they first took a win in 1983. In second place after some early scrapping was Antonio Felix da Costa (Carlin), from Luis Felipe “Pipo” Derani (Fortec Motorsport). Even before the start there was drama on a day that was marred by absolute mayhem in the World Touring Car Championship’s final weekend of the year. Harry Tincknell (Carlin) was required to start the race from the penultimate grid slot after being deemed to have caused an avoidable collision in Saturday’s qualifying race when he ran into Tom Blomqvist’s stalled Fortec Motorsport car on the grid while looking at his own dash. He was joined on the final row by Nelson Mason (Jo Zeller Racing), the Canadian having ignored a drive through penalty because he had not seen the boards, and his radio wasn’t working. By the time he realised he’d been shown the black flag. Kevin Korjus (Galaxy Double R Racing) was just ahead of them because of an engine change, his car having ground to a smoky halt on the last lap of the qualifying race. There was carnage at the start (though it paled into insignificance when compared to the massive crash behind the Safety Car in the second WTCC race. Still, it was messy enough. Someone stalled on the grid but managed to get going, while at the front there was a deal of bumping and barging as they raced down to Mandarin for the first time. That proved costly for Felix Rosenqvist (GR Asia with Mücke) who smacked into the barriers after disputing the line with Marciello, and was out on the spot. Marciello’s car also sustained damage, but he was able to keep going. Shortly afterwards, John Bryant-Meisner (Fortec Motorsport) got forced off the ideal line by Lucas Auer (Theodore Racing by Prema) and crashed into the Armco, while Sean Gelael (Double R Racing) spun trying to avoid the Swede and was collected by Auer, all three of them also out of the race immediately. Not to be outdone, Antonio Giovinazzi (Double R Racing) spun at Melco and took a while to get going. To no one’s very great surprise, the Safety Car had to be scrambled while a massive clean-up operation got underway. Lynn was leading with Derani, who made a storming start, in 2nd. 3rd was da Costa, from Marciello, Alexander Sims (ThreeBond with T-Sport), Stefano Coletti (EuroInternational), William Buller (Fortec Motorsport), Jordan King (Carlin), Carlos Sainz Jr (Carlin) and Nicholas Latifi (Carlin). 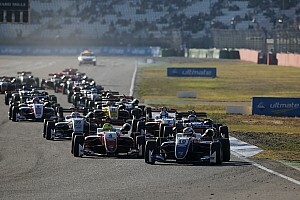 Lucas Wolf (URD Rennsport) was 11th, from Yuichi Nakayama (TOM’s), Jazeman Jaafar (Carlin), Katsumasa Chiyo (B-Max Engineering), Yuhai Sekiguchi (kfz-teile24 Mücke Motorsport), Blomqvist, Sun Zheng (Galaxy Double R Racing), Korjus and van de Laar. 21st was Tincknell, from Ed Jones (Fortec Motorsport), Mason, Esteban Ocon (Prema Powerteam) and Giovinazzi. They circulated around for a handful of laps before finally going live again. At the restart Lynn controlled the situation nicely, while behind him Felix da Costa powered past Derani at Lisboa to take 2nd from the Brazilian, while Sims took a long, hard look at Marciello before realising he wouldn’t make it if he tried and settling back into 5th. In 6th was Coletti, who was being harassed by Buller. As if that wasn’t bad enough, Sainz squeezed through on King and the two-way battle suddenly turned into a three-way fight. It was probably not going to end well! A laps later, and as Lynn continued to pull away from Felix da Costa, Marciello tried to force his way past Derani. Derani resisted for all he was worth; he was not going to make it easy for Marciello, not after Vallelunga when the Italian passed him behind the Safety Car but no one saw anything, not in Italy anyway. Another lap, and Sainz Jr got ahead of both Coletti and Buller, only to end up behind them when they came by again. Marciello, meanwhile, was still trying to find a way past Derani’s now very wide Dallara. Finally, at Lisboa he made it through for 3rd, while behind him Coletti crashed out, while Buller spun but managed to get moving again, leaving Sainz Jr clear in 6th, at least until Jaafar caught him up, the Malaysian charging up the order in a very determined manner. Lynn continued to pull out an ever larger gap, while behind him Felix da Costa did what he could to try and pull back some time from somewhere. He was lucky that Marciello was still busy with Derani, as the Fortec driver tried to come back at him for 3rd. Back in the pack, the Carlin boys were running alarmingly close together, with King now best place rookie, in 7th, as he and Jaafar passed Sainz Jr when the 6th place battle fell apart, and Latifi bringing up the rear of the group. Meanwhile, Zheng had gone off at Fisherman’s Bend causing a brief yellow flag period in Sector 3, which calmed everyone down again at least for a while. And then there was a big surprise, when Marciello made a classic Macau mistake, getting R Bend badly wrong and slamming straight into the barriers, removing himself from the top three and giving Felix da Costa something of a breathing space. The Portuguese driver duly made good use of it and started to catch Lynn again, though it seemed likely he would run out of time before he could pass the Englishman. And so it would prove. Lynn came home to win by 1.173 seconds from last year’s winner. In 3rd was a delighted Derani, while in 4th was Sims, again proving that he and T-Sport make a very good combination. 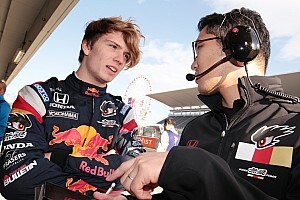 5th was King, setting fastest lap of the race on his final lap, and 6th went to Jaafar, from Sainz Jr, Blomqvist (who took 8th from Latifi), while in 10th was complete F3 rookie Ocon. 11th went to Sekiguchi, who held off Nakayama, a recovering Buller, Tincknell, Chiyo, Giovinazzi, Mason, van de Laar, Jones and Wolf, who ended up stuck at Lisboa on the final lap, and Korjus (who had a pit stop and was two laps down).